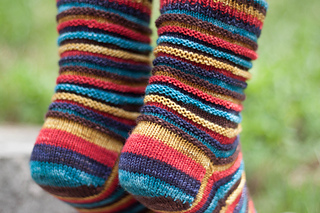 Socks are such fun to knit, but sometimes you want something more than just plain vanilla. Tootsie Rolls is a pattern that adds some flavor to your favorite yarns, giving added dimension to your socks. Rows of reverse stockinette are easily arranged to create squishy rolls of coziness for your “tootsies.” Perfectly paired with your favorite self-striping yarn, these socks knit up quickly from the top down. 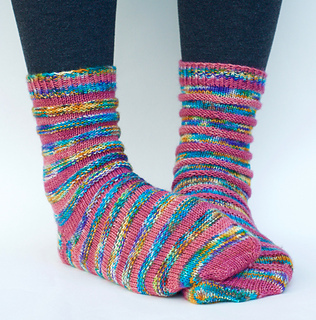 This pattern provides tips for working with plain or self-striping yarn to give your feet a delicious new indulgence. Enjoy your Tootsie Rolls! Tech editing by Kate Atherley. p.3 Repeat rounds 1 and 2 for 6 more times.